Perfect for at home or on the go, these mini crystal grid kits contain everything you need to set up your own crystal grid to boost your creativity and attract inspiration. The sizes and shapes of the stones may vary slightly from the example pictured, but you will receive the same stone assortment and the same center stone. 1. 1 Clear Quartz Pyramid that measures approximately 1 inch square. Clear Quartz is thought to be a Master Healer. It is a perfect stone for amplifying your intention, as well as the effect of other stones. It produces harmony of the body and mind, allowing one to think more clearly an act effectively. Increases physical and mental energy, perseverance, and patience. Re-directs negative energy to a positive state. Enables one to laugh and love more easily. Pyrite stimulates intellectual power. Promotes recall of beautiful memories. A stone of manifestation, it motivates one pursue their dreams and supports action to achieve success and fruition of their inspiration. Helps sustain a state of well being. See behind facades. Defending equality. Shields one from negative energy. Protects from dangerous work. Brings luck. 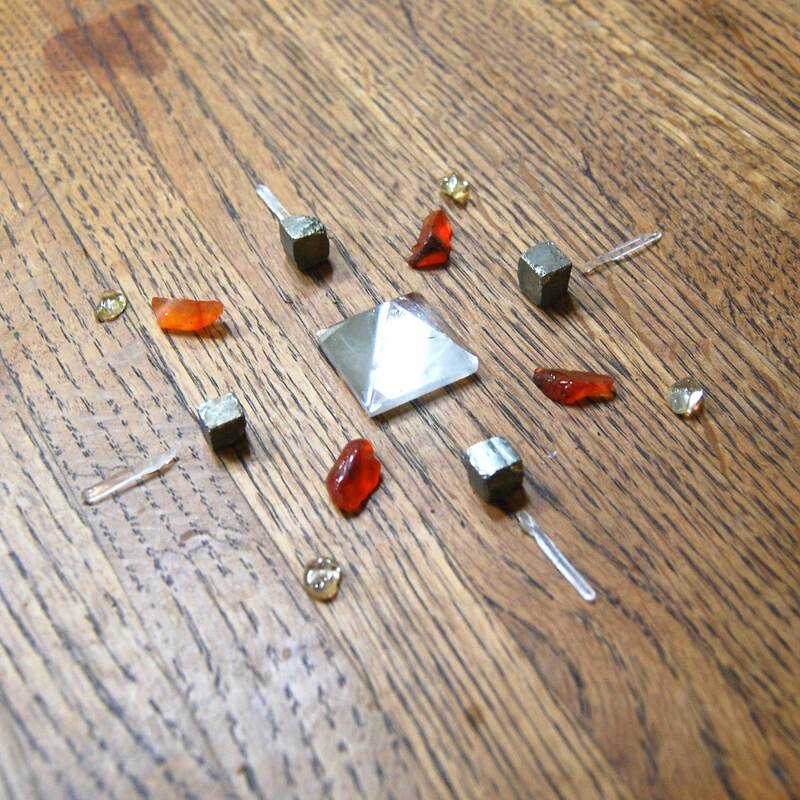 Carnelian is a stone of creativity. Stimulates inherent talents, bolsters courage. Excellent stone for public speaking. In confers eloquence and confidence. Assists in theatrical pursuits. Protects against envy, fear, and doubt. Stimulates sexual impulses. Citrine enhances intelligence. Promotes a happy disposition. Encourages one to look forward towards the sunrise. Brings comfort and optimism, all of which lend to a more inspired and creative disposition. It is also a stone of Wealth and improves financial situations. Brings about good fortune and prosperity in business. Attracts good luck. 5. 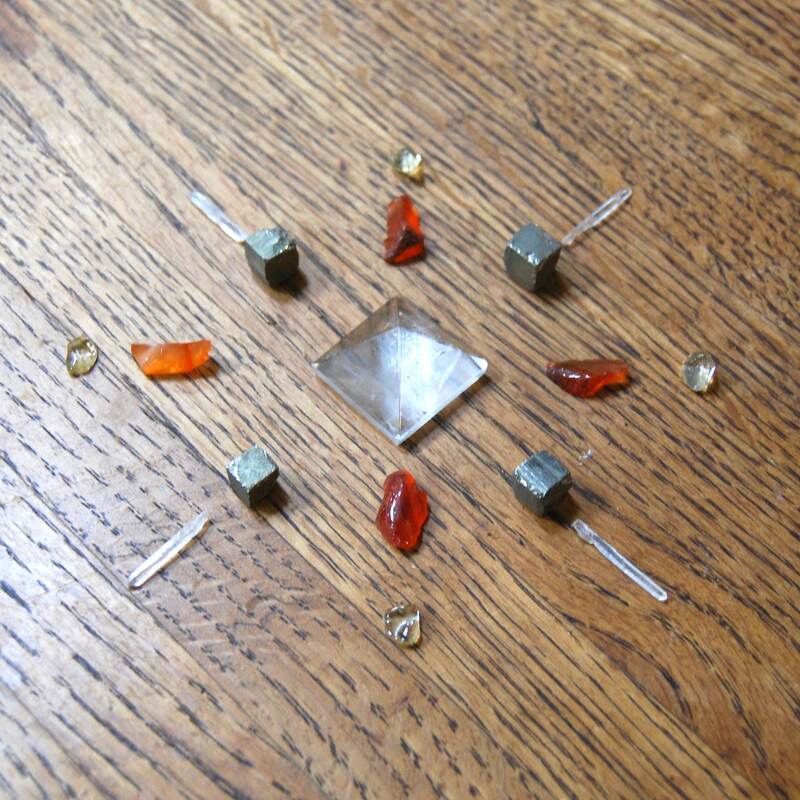 4 Clear Quartz needle points.